The circle of fifths is a handy thing to know for guitar. A lot of guitarists don’t learn theory things like this but there are advantages to doing so. Knowing the circle of fifths can really help with song writing, improvising, transposing and when you are trying to work out how to play a song by ear. But it’s also great to know in any situation where you are playing with other musicians. This, and other theory, may come in conversation during a rehearsal and things go a lot quicker and more smoothly if you know your stuff – rather than them having to sit you down and explain it. 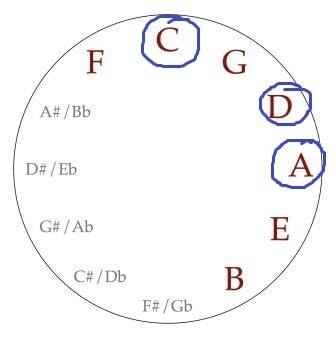 So, here’s how the circle of fifths works. Thankfully this is actually one of the easier aspects of theory to understand. But it’s a helpful way to look at it to put it in a circle. So, let’s first explain what a “fifth” is for those that are unsure. A fifth, sometimes known as a “perfect fifth”, is a note that is 7 semi-tones above the note you just played. For example, if you start from C, then G is the fifth as it is 7 semi-tones above the C.
C, Db, D, Eb, E, F, Gb, G.
So, if it’s the 7th semi tone why is it called a 5th? It’s a 5th because it’s the 5th note in a diatonic scale. For example in the scale of C major, the 5th note is G.
C Major scale is C D E F G A B – the 5th note is G.
First let’s take a look at the 5ths for the 12 notes on the guitar. The first letter below represents the starting note and the second letter represents that note’s 5th. 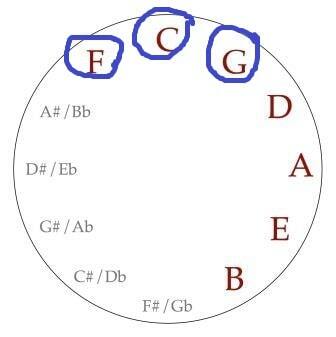 If you play through this circle of fifths on your guitar, playing the chords for each, you will hear how well these chords fit together. Fifths are naturally nice sounding when they go together. You will probably feel as you play that these are very natural chord progressions for you to play. This is because they are very commonly used in songs – so you would likely have made these chord progressions countless times before – even if you are relatively new to the guitar. One great thing you can use the circle of fifths for is for transposing a chord progression. For example, let’s say you have a chord progression in the key of C that is C major, F major and G major but you want to transpose that progression into the key of A. You could sit down and work this out or you could look at the circle of fifths and figure it out more quickly. 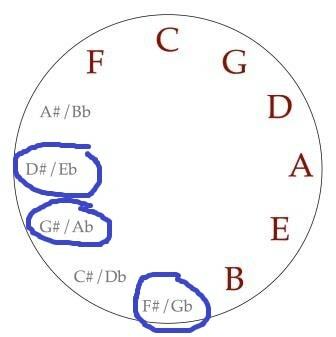 For our example chord progression we go from C to F to G. On the circle of fifths that means you are starting at C going anticlockwise 1 position to get the F and then going clockwise one position to get the G.
To transpose this into the key of A (so that the chord progression is the same but starting on A major) you simply choose the chords that are 1 position anti-clockwise and 1 position clockwise from A. So that same chord progression but starting on A is A Major, D Major, E Major. What About Minor Chords and Seventh Chords etc? The same applies when minor chords, seventh chords etc are involved. For example let’s take the chord progression – Am, C & D7. Let’s say you want to transpose this so that you are starting on Ebm. The C is 3 positions anti-clockwise from the A and the D is one position anticlockwise from the A. 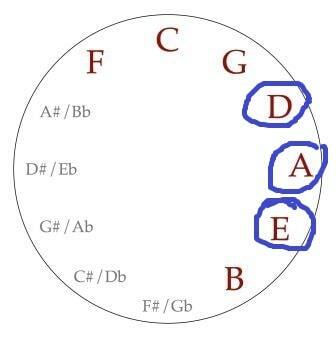 So, using the circle of fifths, let’s take our new starting point of Ebm and pick the notes that are 3 positions anti-clockwise from Eb and one position anticlockwise from Eb. So now you have Ebm Gb & Ab7. The same chord progression but starting at Ebm. So, there you have the circle of fifths for guitar. The examples above are just some of the uses for this. You can use it for transposing scales, creating leads, writing songs, working out harmonies and the list goes on. 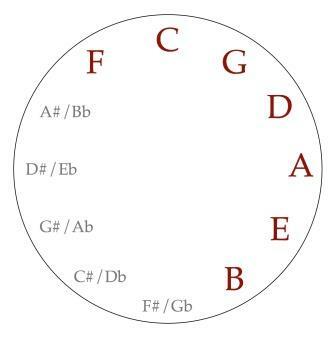 For a more thorough look at the circle of fifths and for more that it can do (this really is a versatile tool!) check out the link below.